In the previous post, we discussed why doubling the number of segments in the automatic integrator based on multiple-segment trapezoidal rule is more efficient than increasing the number of segments one at a time. But this advantage involves having to store the individual function values from previous calculations and then having to retrieve them properly. This drawback was circumvented very efficiently by using the formula derived in another previous post where there is no need to store individual function values. 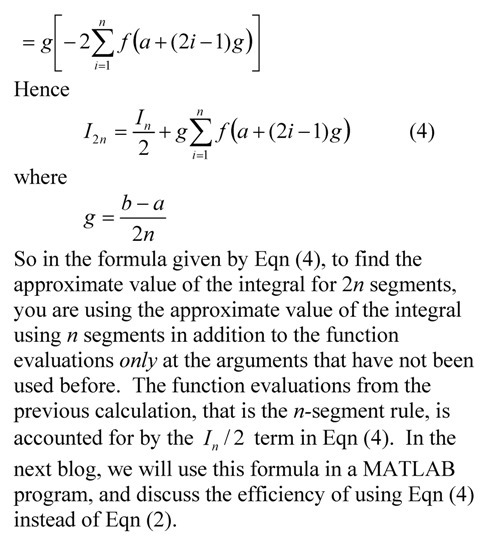 The matlab file for finding a definite integral by directly using the multiple segment trapezoidal rule from this post is given here (matlab file, html file), while the matlab file that uses the more efficient formula from this post is given here (matlab file, html file). Here are the inputs to the programs. We ran both the program on a PC and found that the more efficient algorithm (51 seconds) ran in half the time as the other one (82 seconds). This is expected, as only n function evaluations are made for 2n-segments rule with the efficient formula, while 2n+1 functions evaluations are made for the original formula. In the previous post, we discussed why doubling the number of segments in the automatic integrator based on multiple-segment trapezoidal rule is more efficient than increasing the number of segments one at a time. But this advantage involves having to store the individual function values from previous calculations and then having to retrieve them properly. This drawback can be circumvented very efficiently as explained below. What you will see is that there is no need to store individual function values. How would you know how many segments to use in a Trapezoidal rule of integration to get an accurate value of the integral? This can be done by applying the Trapezoidal rule for 1 segment rule, then 2 segment rule, followed by 4 segment rule and so on. As soon as the absolute relative approximate error (page 5-6) between the consecutive answers becomes less than the pre-specified tolerance chosen by the user, you would have your integral within the accuracy you desired.